It’s easy and everything is just a push of a button away. In less than 3 minutes I have reserve my movie or even get a refund back. No problem at all with this app. It’s worth the free download. This app won’t let me buy tickets for my friends, no matter what. I have to use Fandango to book seats beside me. The ONLY reason I use it now is for the A-list. Too much of a hassle. I love the AMC app! It’s easy to use, quickly shows all movies & times in the theaters near us. The link to my Stubs card works perfectly, and pre-ordering tickets is a breeze. Thank you!!! Stubs is where it’s at! Works great and love the Stubs program!!!! Plus AMC has the best theaters with both IMAX and Dolby Cinema. Get it if you go to movies at all! So easy to use and so far we’ve saved $55 on tickets through points accumulated. Just love this app. I have no problems with this app. It is easy to save favorite theaters, find movie times, buy tickets and choose my seats, and even have food delivered to my seat. I just have my phone scanned to get in. Very convenient! Now that you can buy the $5 tickets on here, there is no where else to see a movie! Forgot my password and it won’t email me so I can creat a new one, so now I’m locked out of the app. This is bs. I’m going to lose all the points I’ve earned over the years if I open a new account. Wonderful application on both iPad and iPhone. A-List is the Best Membership! AMC A-List is by far the best monthly theater membership. Ordering seats ahead of time as soon as they go on sale is amazing! You can also order a non-A-list persons tickets in the same order to ensure your seats are together. You can even order up to 30 total tickets! Adding food that can be delivered when you get there is convenient. You still get points for Premiere Stubs as well. A-List is well worth the $20 per month and my wife and I don’t regret signing up! If you’re a movie lover and go to at least 3 movies a week you need A-List! I have used this app for several years. I like using it especially since I lose my stub card all the time. This app has all the features in one and I don’t have to sit in line at the box office. Outstanding, easy to use app with plenty of benefits. If this app was a person it would be Ryan Reynolds. I love that I can book ahead of time!!! Huge bonus compared to MoviePass. One thing I wish you could see is your seat assignment prior to checkout, when you’re on the seat selection screen. Seems like it would be an easy fix? Everyday I learn something new regarding apps on my iPhone. I no longer have to wait in line to get a seat at the movies, this AMC app is a breeze for this senior. Let’s me know where all the movies in any amc theater are playing with locations. Must have app, if a movie goer. AMC makes it easy to find a theatre anywhere and purchase seats. Use this all the time to purchase our movie tickets. Don't wait in lines any more. I love being an A-List member. It’s so easy and only 20 bucks a month to see up to three movies a week...what a deal. If this is what it takes to get me to the movies more often....it worked!!! Extremely helpful in allowing me to connect to my favorite theaters here in New Jersey and in New York! Also, in helping book shows, find times, learn what current promotions are available to me and my reward points! Also, HIGHLY recommend the STUBS A-List membership. This app is so easy and convenient. It allows me to search, pre-order, and buy tickets so easy and early. It makes live easy when you want to see a movie. Probably the best movie app there is. I’m also an A-List Stubs member so the perks of using the app and viewing your progress is that much better. I love going to the movies but I hate waiting in line to buy tickets and I am constantly late to places so being able to buy my ticket in the car and just go get it scanned is so easy and convenient. I no longer have to sit front row of the theater and miss the previews because I don’t have to wait in line. The added bonus of being able to buy your snacks on the app then just go pick them up is awesome as well. After years of being the most useless app ever made, they have finally fixed it to the point where it is simple and easy to use, I can actually pay for tickets! AMC is the only theater I go to see movies! Loving this new 3 movies a week for only $19.95 a month! My husband and I receive rewards every time we see a movie! Really helps keep costs down while still being able to go on a date together, experience and enjoy movies in a theater and not at home. The best way to enjoy movies! Thank you AMC! Sets the standard for movie theater apps! The AMC app is great as long as there is no glitch, if it glitches then it is difficult to get things straightened out. The premise, the features and the savings can’t be beat, just breathe through the occasional glitch and you’ll love it! I love this app. Especially for the theaters where you pick your seat. Open the app, make your selections, purchase and go. Easy peezy! I find amc’s premiere program the best and AMC’s app makes being a member and using amc’s services very easy and seamless from purchasing to seeing the film. Well done all around. I was always a AMC Stubs member but I have to admit this new A-List subscription and ticket check-in with your mobile phone is amazing. I love the app and I love the membership. User friendly and convenient app. Love AMC STUBS and App!!! Best service offered by any theater! Love AMC App! So easy to use and avoid lines at theater! Absolutely love the AMC app! It makes it so convenient to purchase tickets and use your points at the concession counter. Best way to buy movie tickets! I use this app all the time. It’s so convenient anytime anywhere I go. I’m totally happy with choosing my own seats. Version 6.18 is missing the styled icons in the 3D Touch menu. I can not open the APP. I order all my tickets through the app. So convenient and since I only go to AMC Ontario nothing is ever a surprise! I think it’s convenient!! It’s honestly the best way to get your tickets before a movie sells out and also the benefits it’s provides you is astounding. App has been great for me and with AList now out will become a constant use tool. GJ AMC it took MoviePass to come to senses but well worth it. I have zero issues with this app other than it prompts me to renew my account stubs premier membership with every purchase(and every time you open the app) even though I’m already a stubs subscriber. Makes me feel like they just want to extend my membership before it actually expires. Please change it so that it prompts me when it’s actually time to subscribe. I have never been great with Apps. But after calling the support number, the bugs were fixed and I can use it without problems. This app is awesomeness! Super easy to use and always quick and easy! We are premier members and this makes it so much easier to use when buying concessions and avoids having to wait in line to buy tickets. Easy to pull up on my phone! Love this app. We have seen more movies because of this app! Did the update today now the app won’t open????? I’m happy with the app. Of course there’s no such thing as a perfect app but it works for what I need so no complaints here! Love this app! Buying tickets is extremely easy. Having a premiere membership is well worth it. $5 tickets on Tuesdays and discounted upgrades on popcorn and drinks. It’s a must have for anyone that goes to any AMC! Yessssss. Exactly what I’ve been waiting for. Works great with the app as well. Thank you! App Won’t Start - Don’t Upgrade! AMC launched a new program today and updated their app to enable to new program. However, the app no longer works. So, now we’ll need to wait until someone figures out what they did wrong and download the app after they fix the crashing bug. As a Stubs Premiere member, it’s very disappointing to loose access to my points, rewards and benefits. Idk what just happen with this last update y’all just pushed out but it wiped out my ticket history and removed my current ticket purchase. I’m not sure what y’all just did but it needs to be fixed immediately. I now have no ticket to see my movie this morning and that ain’t cool. This app was great til this last update. When tapping the A-List Banner on the App, which the app sent a notification for to tap, it crashes the app. not a very good app to begin with - littered with bugs. now it won’t even open. how does something like this get through review? Since updating to V6.18.0 the app crashes no matter what I press. PLEASE FIX! This app has made it extremely easy to see movies. I love that AMC has upgraded to choosing seats. I won’t see anything unless it’s in Dolby! Customer service has also been very helpful when I encountered a rewards problem. Hour glass spinning when searching or buying tickets. Feel like it’s trying to route to somewhere else and like using a website but in an app. Fix the slowness and rating will go up. I have been using this for a couple of years and each update makes it a bet easier each time. I am stubs premiere and it is very handy for purchases, tracking and redemption of rewards. Would be nice if it was easier to figure out the favorites movie tracking but overall one of the keeper apps on my phone. I was able to open the app last night at 10:30pm but this morning after I signed up for A-list every time I go to open the app it crashes within 2 seconds. Normally the app is amazing and I love using it. I hope this gets fixed soon. I love using the app to make movie purchases. It’s so easy to find the movie you want, on the day you want it with the seats you want. It’s also convenient to use the Stubs rewards through the app. I’ll never buy another ticket at a counter again. Do it for the RunPee! My husband has the bladder of a peanut so having movie info on good breaks for him to run to the restroom is totally worth having this app! Makes my Stubs member card easy to find, good rewards, easy to navigate. I just got into going to movies again with the family. Love this app as it makes life so easy and without all of those service fees. Bye to all them other apps! Pick theater, pick time, pick seats, pay! Lotta picking & grinning from me! Great app! Bought tickets through the app and it was simple. The app is every convenient to purchase tickets. We don’t ever have to stand in line at the ticket booth anymore. The only reason I didn’t give it 5 stars is because sometimes there are issues but not too often. The app is solid and works pretty well. No need to stand in lines to miss you favorite movies. Great app always convenient especially being an AMC member everything is linked. You can add your reward towards your purchase with no problems and store your reward card including your payment information for even faster service. All in all, great app. This app is convenient and easy to use. I love this app it’s super easy to use. Haven’t had issues with this app yet. I’ve signed up for Stubs, ordered tickets, etc. Always quick and easy. It’s quick , easy and simple . I don’t have to stand in line to buy a ticket , they scan my phone and I’m heading to my movie . Use the app every time we go to the movies! Love not waiting in line to purchase tickets. Even happier since the $5 Tuesday movies with my Stubs card is now purchasable through the app!!! Quick way to buy tickets and earn rewards! Easy to use. Customer service was great when I had an issue. Tried several times over different times of day today to order movie tix only to receive an “Oops - unable to fulfill order at this time”. And that happens after going through the entire purchase process including adding my cc info, which now has a pending charge. The app saves me so much time and is amazing to use. Can NEVER purchase tickets, I select the seats I want and it asks me to sign-in. I AM SIGNED IN!!! I sign in again. It asked me to sign in AGAIN!!! It reserves the seats BUT I CAN NOT SELECT THEM OR FINISH MY PURCHASE!!!!! So the seats are not selectable, I have no tickets. RIDICULOUS App. DO NOT DOWNLOAD! Just use the websites IF THAT EVEN WORKS. I highly advise maybe using a laptop, if you’re lucky, it will work. I’m seeing bad reviews...and it has me scratching my head🤔 ...how can you rate this app bad? It works well, has tutorials, keeps you in the loop with your movies, movie purchases and stub points/rewards. I think the bad reviews are user issues not app issues 🤦🏾‍♂️ I LOVE this App! Love using the AMC app in conjunction with our AMC Stubs Premier membership. I can search for movie times, preorder show tickets and concessions. Plus the Stubs section is great! I can show my ticket code on my phone at the box office and skip all the lines!! Makes me enjoy going to the movies. I can skip the long lines. Since I’m a Stubs Premier Member I can check my rewards and redeem rewards easily. Love the ease of this app in lieu of standing in long lines at the ticket counter. Purchase from app, scan QR code, and you’re in! Very user friendly love the app. This app saves so much time and is easy to navigate. Theater location, movie, date, 3D or digital, seat select. Pay(1 click if you save your info). Done! Enjoy! SOO BUGGY! CAN’T PROCESS PAYMENTS! This app has been a pain to use. I’ve tried to buy tickets multiple times over a period of a year and it randomly won’t accept payments from my card. I’ve held up the line at the movie theatre at least 4 times trying to get the app to open so I can show the lady my ticket. God forbid you have 3 bars instead of a full 4 bars because it will be the most lag filled app in the world. Use the website instead. Quick and fast Ready to go easy on refunds! They’re on point!!! A lot better than before. I like all the new fingerprint features. 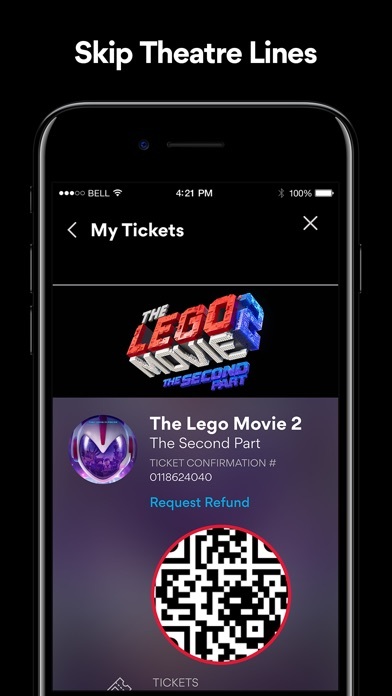 This app makes it easy to find and select our tickets ahead of time, add them to my Apple Wallet and breeze through the movie check-in saving us time. My only issue is that we go to the one AMC at Disney Springs, which Disney Passholders get a discount at, and I am unable to apply my discount on the app. The discount is only available once at the theater, which I think is a Disney problem, so it’s really not a money savings but more a great convenience! I can also manage my Stubs Account on the app donut makes it even easier. Love this app and will continue using. Amazing fast and very convenient way to download the app and order tickets and earn points!! Love this app!! We are premiere account holders (totally worth it! We don’t go to see every movie that comes out but we’re saved over $75 so far and with this app there is no fee (eat your heart out fandango😉) to prepurchase tickets and you can go straight to the ticket taker and scan your tickets and go right in! I once thought you had to scan the app at the kiosk but now you can go right to the person who tears your tix and go in!! Amazing!! it’s amazing , they text you of upcoming events and also send reminders. on top of it get special extras for being a premiere member. I haven’t had anything but great experiences so far. Buying tickets is easy as is returning tickets! Love AMC and this app! Have used this a few times and it is quite easy and quick! Only one thing I would suggest be added. A Military discount. You give a military discount in the theatre’s but not on the app. I love this app. I can set up reminders on when tickets go on sale. I can purchase my seats here and skip the long line at the theater. Well organized and easy to use! I like using this app. It’s convenient and easy to use. Keeps tracks of my ticket purchases and stubs rewards. Can purchase tickets through the app and pick up as the kiosk in theaters. No standing in line for tickets for me! I had problems with the app when I’m ordering food but for purchasing tickets and getting my point, I have no problems. 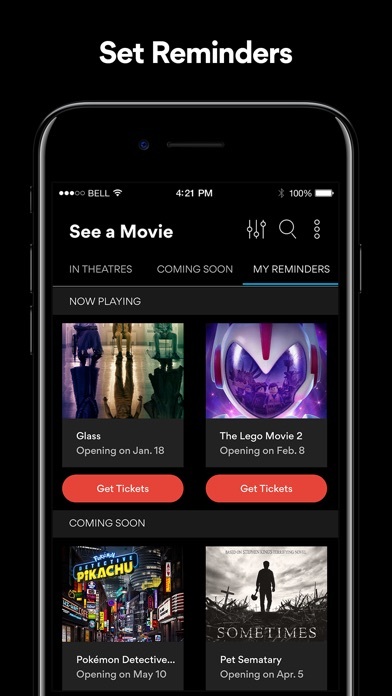 No sure if they have recently updated it, but the app seamlessly integrates theater, movie times, seat selection and payment without any annoying adds of crazy pressure from a countdown clock. Easy to use. Fast and friendly!!! Don’t have any issues at all. Love that we pre purchase and just scan when we get there! Simple, easy to use. Great for making reservations without having to go to the venue. Love this app. It’s easy to use and very convenient. Was able to quickly find time, seat selection. Appreciate quick refresh to change selection. Our theater has reserved seating now, which I love. But when I buy a couple weeks in advance, I can never find the email day-of. Now I just go into the app and it tells me where my seats are. The ticket taker just scans my phone and we’re set! So easy, fast, and convenient!!! This app has a horrible rewards system, you get way more free movies with movie pass. This app is not worth the memory it takes up on your phone. I really like this app. I find it very easy and convenient. Rarely have any issues with it. Since getting it, I have not purchased tickets at the counter for years now. Really like it. Folks can also add electronic tickets to their Apple wallet. The only downside Ive experienced with it is when buying advanced tickets and I can’t make it for the time I bought, you have to cancel before the show starts. Otherwise you can’t refund using the app. But guest services has always accommodated another time. You just have to physically go to guest services. Easy to use and a great help in getting your tickets for the movies. Plus you get to see your points rise as you see movies as an AMC stubs member. Fun and easy app to use and very helpful, get this app! The app was easy to navigate. Subscription to the AMC STUBS program was a breeze and took less than 5 minutes! 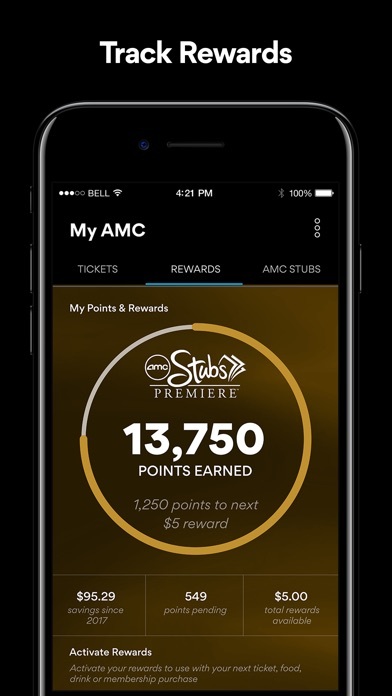 The app is straightforward and simple to enroll in the AMC STUBS program. No where on the app does it spell out a 3.20 convenient fee. When you try to apply for refund you can kiss your convenient fee goodbye. This is something trump would do. I’m a premier customer & can quickly & easily buy tickets, keep track of points, & apply credits to purchases. 5 stars!! Easy to use. Applies Tuesday savings on checkout. Just starting using app so far so good. Hard to set up originally but it may have been my connections at work. 1st time user but was very quick and easy. I’m sure I’ll use it often!! Unlike some of the reviews I’ve not had any problems with login for several months. Great way to get tickets. I go to the imax a lot and like picking my seats on the app. Great getting texts and emails of tickets. Tickets also load straight to app. So I was purchasing the tickets and I didn’t get the email containing the tickets. So I figured I sent it to the wrong email and tried calling multiple times. I finally decided to drive down there to see if I could get my tickets there or something and I did. Two hours later I finally got the tickets sent. This app makes ticket purchases so easy! I love it ! Love the simplicity that this app offers! It’s so quick to buy tickets and pick your seats! If you haven’t used it yet, you’ve got to give it a try! No more ticket lines or printing tickets out at home. Just show the tickets and memberships (if you have one) on your phone. Everything purchased shows points for stubs members. Love being able to access $5 tickets. Honestly this app makes going to the movies WAY easier. You can select favorite theaters, see special events, pick your seats- times etc. I have to say I 100% recommend becoming a stubs Premiere member- 5 DOLLAR TICKETS ON TUESDAYS. C’mon! When you go to the theater you get free size upgrades and you don’t have to wait on long lines. If you’re a movies goer this is the app to get. So easy to use and you save some money. We use the app on an iPad and our phones with no issues. Makes getting our tickets easy and convenient. Love the app that allows us to pick our own Seats ahead of time for our movies. Great idea. Easy to use and. Fairly easy to use and nice to have. Makes trips to the movies simpler. I doesn’t make since to charge someone $15 and say u can skip the line and go straight to the Premium line. Next year I won’t renew. Better hope the app works. I had a problem purchasing tickets. Credit card was charged, but no confirmation. Customer Service said I didn’t purchase (even though the tickets seats were taken) and my cc would get refunded in a couple days. Two reps on different days told me to purchase tickets again (picking different seats). In reality, I did purchase tickets the first time but glitch in app didn’t send me confirmation, so I ended up getting twice as many tickets as I wanted. Luckily the theater was able to fix, AMC was not (they made things worse). I love this app so much. Super convenient and fast. No more lines and that’s ALWAYS a plus. My one and ONLY issue is the reminders for advanced ticket purchases (or any ticket reminder) goes to your email. I don’t check it every minute of the day so I end up missing getting my fave seats in my fave theatre. It would be more helpful and make more sense to receive a text when tickets are on sale (instant visual AND audio reminder). Other than that, this app is GOLD! It worked when I used it. Took about 10 minutes to set up but I was able to purchase tickets immediately. So far so good. I’ve waited to leave a review for a long time because I kept waiting for it to stop working so great. I love this app. I never buy tickets at the theater anymore. I just purchase on the app and go right in when I get there. Only thing they could add to make it better would be a screen that has all the movies and showtimes for that day for the theater. Keep it great and Stubs Premier Rocks!! This app is good in theory. It could be great. The problem is, it hardly ever works!!! You get your purchase set up, credit card number entered and then it tells you that the app is temporarily not working and to come back later. I get that message 9 times out of 10. It is so frustrating that it makes me want to throw my iPad or phone (happens on both). I have used this app on and off for about 2 years. Because it doesn’t really work I rarely use it these days. When I do it is only to look up movie times. PLEASE FIX THE GLITCHES!! Have had no issues. Works well and flows from iPad to phone seamlessly. Has everything I need right in the app! 5 stars. Never gives me a problem! I can purchase my tickets whenever I want and get an refund just as easy! The app works great except that there is no way to get the student discount on the app as I would be able to get if I bought the tickets at the box office. What’s the purpose of the app when it keeps logging me out and then not accepting my login information. I can login on the website no problem. This app makes thing so much easier! It helps me keep track of my points, free things I am eligible to get, and keeps me up to date with what new movies are out. I love this app! Definitely better than waiting in a long box office line! I use this app every time we go to the movies. It’s SO much better than waiting in a long box office line to buy tickets! I like that I can get my tickets and reserve my seat before we head out. There is nothing worse than getting to the theater only to find your show is sold out or there are not enough seats together. It’s all taken care of before I hop off the couch! I can see what’s out, what’s coming out, all of it! Keep up the hood work AMC! 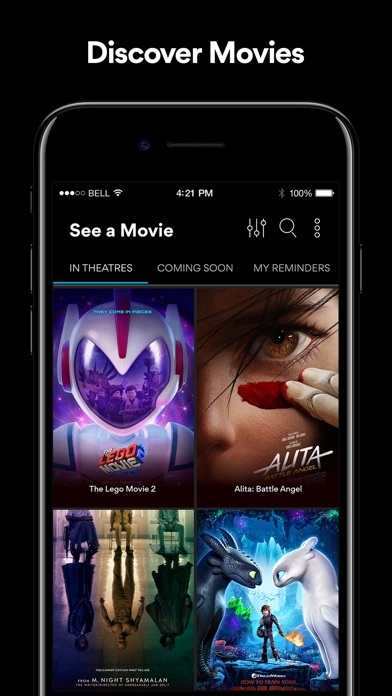 I love everything about the app, I use it every time I want to see a movie! I love all the privileges premier members have. So convenient and easy to use. I love the reserved seating option!! I LOVE IT! who doesn’t love the movies!!!! This app is the best!! Great offers and all!! Total game changer for my family. As a family of 7 it can be difficult to get seats all together at the theater. Now we buy our tickets early online and arrive in time for the movie. No sweat! I have no problems with the app. My husband and I share it. The rewards program is great and also getting to cut to the front of the line for our popcorn and soda. I love AMC! I’m so happy they bought our neighborhood theater. The only reason I’m not giving a 5 start is because I can’t use my student discount in the app. So I just basically use it to see the movie time and the points. I wish they can include this feature in the app. This app is easy to use, and it’s really convenient, too. I’m also a big fan of how the tickets can be saved in my wallet app. Such a nice feature. I love this app!! I have everything at my fingertips. So easy to browse all of the movies, choose my seats(which was the best idea ever) and i even had an AMC gift card stored on here that I would have forgotten about. All I had to do was press a few options and movie tickets are now on my phone! I love this convenience!! To be honest this app alone has made me see more movies. Very easy! Don’t go to the movies without it! I have been an AMC stubs member since the beginning. When this app first came out it was terrible, super buggy. You can tell they put a lot of work into it because now it is just awesome. It is the only way I buy my tickets and I never have any issues with it anymore. Makes looking for and buying tickets super easy. This app makes purchasing movie ticket a snap! It’s fast and convenient...just a few clicks and we are on our way. Plus, we earn points to get snacks for less! This app is really poorly designed. I have 2 accounts and was not able to sign in with either account. I requested to change my password and got an error message but no description of what the error was. The app said it sent an email to reset the password.but no email was sent. I’ve never had a problem using this app. It’s pretty straight forward. Easy to use and navigate! Love having easy accessibility to my points, rewards, tickets.. great app to focus more on the movie experience rather than worrying about everything else! I really like the AMC app. I hope someday our theater here in Lake Jackson, Texas will get recliners and reserved seating. Right now we have to use the app to make purchases in Houston theaters. Works great every time & is SO easy to use. Used two different phones, both end with the same stupid result with some error of being unable to purchase tickets. I’d give this app a -10 star. I just downloaded this app and I love it. I picked my seats and paid for my tickets! So convenient!!!! It’s really that easy, it’s too easy not to have! Downloaded the app and it won’t let me login. Tried resetting my password through browser and still won’t let me login. Garbage. I have been using this App for about 6 months now. My family and I ho to the movie every Saturday. And I love the convenience of not having to stand in line!! Its great!! I love it!!! So far so good. Loving the perks! The website is buggy and lost several good seats because couldn't get logged on. Went to the app and no issues at all. Great app! Love the app. Payed for the membership and totally worth it. This is a great movie theatre app! Our other local movie theatre’s app stinks compared to this one. Plus, I like that you don’t get charged a convenience fee if you have a AMC stub membership. IOS, I’ve never had any issues with the app. Very easy! App freezes and closes a lot. The $5 Tuesday isn’t priced as such in the app. I do like the app but I wished it worked better. I almost exclusively go to AMC theaters and would love to use this app. They had mad a big push to use it over third party apps. However is is very buggy. Crashes a lot and it's not very fluid to use. Make this better and I'll use it every time. Great app easy to use when on the go! Love this app! Love that I can see what movies I’ve seen in the past whether I bought the ticket in-person, online or on the app. I love that it automatically saves my favorite theater based on where I’ve bought tickets at so I don’t have to search for a new location unless I really want to. THANK GOODNESS THEY ADDED THE ABILITY TO BUT $5 TUESDAY TICKETS THROUGH THE APP!!! YAY!! You just have to have a god network before you start. Otherwise it’s great. Best way to use stubs card!!! Use this app to take advantage of stubs Benefits. I’ve always had problems with bringing my card to the theater. Instead, I use the app to buy tickets, get instant discounts etc., without any problems! Very convenient! Make going to the movies very convenient. Excellent benefits great rewards system! A little glitchy at times had to delete then download again. I have had no issues with this app. I can utilize my rewards without difficulty and the process to order a ticket is fast. Good app, I encountered no bugs or issues. Just used for my Tuesday special purchase and seemed to go swimmingly. I’m happy & I recommend highly based on MY experience. The Best way to buy A movie ticket!!!! It has been over a week since I have been able to login to this app. I have deleted and reinstalled the app without success. Note I have been able to login to the web site. Our AMC theatre is on the other side of town but I go there more often now just bc of how convenient the app is and how much it adds to the overall experience. Also the theater is better! But being able to keep tickets in my Apple Wallet, being able to find a nearby theater using the app no matter where I am, paying using the app, etc. makes for a seamless experience. The only reason I didn’t give it a 5 is bc I am still trying to figure out how to interact with the Stubbs Premiere thing using the app and being able to see rewards properly. It feels buggy sometimes but it may also just be user error! Never had a problem buying tickets ahead of time and using tickets on phone. Now that you have added the $5 Tuesdays it’s excellent again. Honestly I haven’t been able to make one feature on this app work. All I get is “network error” and when I try to search for a nearby theater by city OR zip it can’t find anything, when I already know there are AMCs in the zipcode I’m using. And it’s clearly a problem with the app, not my network. All other websites and apps are working fine on my phone and laptop. Will not work. Received network error multiple times. Deleted app and re downloaded. Issues still occurring. Also the AMC website is not working correctly for me now so I do not know if the two are connected or if it’s just my device. Any suggestions or please fix. App gets slower with each update. Loading circles are now longer and on every section of the app. Also regularly get the "network issue occured tap to retry" problem. I downloaded the app today and it has given me nothing but error messages since I got it. I can’t even look at showtimes! And it keeps saying there isn’t a theater within a 50 mile radius from me which is a lie because there’s one 15 minutes away from my house. This is super inconvenient and I am a Stubs member. I loved this app before but does not work now. Can’t locate theaters or showtimes. No connection. Fix it. The app was constantly having mistakes and crashing that my seats I chosen were being taken every time because of the long loading and giving me the “oops there’s been a mistake” message. Had to pick different seats about 4 times. So frustrating. Half the time the app doesn’t respond or takes a long time to load. Please fix this. What’s the point of this app if it just forgets you bought tickets. I bought tickets for Avengers on Friday for Tuesday at noon. Today is Monday and where I once seen my tickets on the app is now gone. So I’m sure I’m going to go through hell Tuesday, but hopefully I’ll just verify via email with them. Love how this app is giving me a bigger headache. Stay away from this crap app. The apps works good except it seems to only works with WiFi. This app is on point 👌🏽 I have no problems with this app. This app makes it easy to check times, view available seats and order tickets! Love it! Now that they have added the $5 Tuesday ticket purchase to the app, I love it!!!! First time use of the app and it was very easy to use! Navigation through the app is super simple. I have an AMC stubs card and it was easy to sign in to my account through the app as well. I would recommend this app to any movie lover! I have enjoyed the new features that go a long way to optimizing my movie going experience! Thank you AMC! Keep it up! Much improved!! Apple Pay and auto stubs # added to purchase ?!? Love it! No more putting 50 digit # in every time! Wanted tickets for Infinity War; whole process to purchase took less than three minutes. No hitches, no glitches. I like this app but it signs me out at random times (usually when I am ready to buy tickets) and then won’t accept my password. So I have to set a new password which is then accepted on the web version but not the app version. Arghhhhhh. Easy to use interface. I always buy my tickets on here as I can select my seats and it saves my cards so there is no hassle. Tickets are on the app too so they just scan my phone and I’m in. Also as a Premiere Stubs holder, my stubs card is connected to the app and I can easily track my points. If you go to AMC, this is a must use app! Love Movies! Love the Rewards! Love AMC!!!! Easy to use, and saves time. I love how I can check different times and settings to see what seats are available at each, compare them, discuss with fam, decide which we like best and then go to that one and purchase them. No standing in line at theatre, just show the purchased tickets and go in. Love the convenience. This app makes going to the movies so much easier now. I love AMC, being able to select my seats when purchasing my tickets is fantastic. Great method of avoiding the hassle of not finding a good seat once you arrive. Plus the convince of not having to wait online to buy a ticket. Just absolutely love it! This app makes it so easy to be logged into your account and to purchase tickets! Also has information on seating and type of theater. Great app user friendly!! Convenient to use anywhere!!! That feature is important with popular movies!! Paid for itself in no time!! This app so far has done great things . I am a amc stubs premiere member. I can also add tickets to my Apple wallet ! No problems so far! It could use a few fixes but overall great app and easy to navigate through. Easy to purchase tickets thru the app and once at the theatre you all they do is scan the barcode and you’re ready to go. It also has rewards for people using the app, it’s very convenient. Having the ability to view all the Theaters and the seating available, makes it so easy to buy tickets. Reserve seating is a must for me and this app makes it effortless to choose. I won’t lie.... the Regal is around the corner from our house BUT for must-see, first weekend movies? No contest. We go to AMC because of the reserved seating, fee-less on line ticketing, recliners, rewards and customer service. Stubs is amazing. Now please please please find a way to open in Santa Clarita!!!! Try checking your card info. I had the same problem because the photo feature put in the card number(s) wrong. I can purchase tickets in seconds, usually while I impatiently wait in line. It keeps track of my points. I don’t really need it to do anything else. I really enjoy the app and it works well. I wish there was support for Apple Pay instead of storing my card information on the app itself. Adding more movies to coming soon and their posters would be good. Otherwise it works well and I enjoy using it. Love the app. It is so easy to find movies at my local AMC theatres. Easy to check out what is showing and can quickly order tickets. Easy to check your rewards. Thanks. Great improvement. Love getting a text with the tix. App won’t even let me register my Premiere card I bought. What a waste. I’d LOVE for the app to show me if I have a reward or not but it keeps saying failed when registering the card. Sad. Go to existing reservation in myAmC, A list for this weeks movies. Click on existing movie and watch the app crash! I don’t hate the app but it is slow And spends a lot of time refreshing pages that it should store Every time it loads my bar code it refreshes. Waste of time Recently I was traveling in Brazil and needed to update my credit card in the app but I guess they have blocked all foreign IPs so it crashes or doesn’t load the data. I’ve never had an issue with the app before, but I purchased tickets for a movie showing for today, and I cannot access the tickets with the scannable code in the app. When I try to open the screen with the tickets, in about 4 seconds it backs out to the home screen. I cannot view my tickets in the app. I know I can access the tickets in my email, but would prefer to have the app working properly. I even shut down my phone and turned it back on, and it didn’t help. I have confirmed I have the updated version of the app. Is anyone else having this same issue? Latest update causes crashing when viewing tickets. App crashes each time I go to view my tickets. Please fix. Cannot load any tickets, straight to crash when I try doing so, FIX YOUR APP AND MAYBE ILL CHANGE MY SCORE!!!! So easy to use!!!! Love it!!!! After a recent update the app cuts off every time I go to My AMC part and I need this fix before I go to the movies on 4/26!! When I try to view my ticket, the app crashes. Not cool. Please fix this ASAP. Can’t even open my purchased tickets! After update to latest revision the app crashes when you attempt to retrieve a ticket that you purchased. Please fix asap ! This is my first time using the rewards points and I wasn’t able to UNDO THE USE OF A REWARD ACTIVATION...NOTTT HAPPY!!! There is no indication of usage by color shading or color change or if it just changed from activate to ACTIVATED which would be very helpful!!!! Tapping the activate button only enlarges the key which I didn’t understand that it was ACTIVATING THE REWARD. The app is ok except for that. With the latest update on 4/15, I am unable to view tickets booked via A-List. The app crashes and no method allows checking the ticket code. love AMC love this App! i’m a AMC Movie A-lister and this app just makes my life easy to select, book and go. perf! The value I receive from joining stubs has been well worth the cost of membership! You once again issued an app update that crashes when you attempt to click on purchased tickets and now cannot load them again just like a couple versions ago. This has to stop! I love the convenience of being able to do everything that I need on the app. Ordering food is easier and helps speed up the process once I have arrived at the movie theatre. I enjoy being able to select my own seat. No complaints thus far. Latest update installed and when I click on an upcoming event to see the ticket, the app crashes. It also crashed right after I completed my purchase. I can get the ticket texted to me, but now way of adding it to my Wallet app. I haven’t had any problems with the app or the AList service. Love it! (I think there should be expedited lines for AList in line @ the theater itself - some places do, some don’t). That’s it though! App crashes with every purchase or attempt to pull up tickets purchased. With the latest update, the app crashes 100% of the time when I try to access my purchased tickets. Sometimes it freezes during a purchase....which is super annoying. But overall very easy to use. App keeps closing after I purchase a ticket and it won’t let me open my tickets that I have purchased. Please fix. The interface is simple and nice although favoriting frequent theaters could be smarter and easier. Recently though the app keeps crashing when I try to access tickets. Luckily, you are emailed your tickets also. App is crashing after latest update. App closes when I try to look at the details of a current A-List reservation. Rebooted my phone but error persists. iOS. This version kept crashing. Pls help. This latest version kept crashing. Please fix it. Best App for Movie Lovers! Period!!! With the most recent update, the app crashes when I try to view my ticket. Otherwise great app. I encourage signing up for the membership. Great benefits that are well worth the cost. One of the best amc theaters out there from the staff, management and crew. Lots of cool people that really go the extra mile to serve and make an enjoyable movie experience. Thanks again! App crashes after latest update. Trying it for the first time not bad. It’s convenient to purchase tickets on your mobile on the go. I like the fact you choose the seating ahead of time. The best thing that has happen since Netflix!! I have been in USA for 7 months now and AMC Stubs is the best investment we made till date. I really love the AMC app it’s great. I don’t have to wait in line to purchase my tickets. Thanks AMC. Very convenient and easy to use, this is an app that has definitely made the movie going experience ten times better. I use this app all the time to book my tickets, reserve seats, even order food. It is really easy to use and convenient. Love the AMC app. Easy to use and even better being a premier member. Have my tickets ready on my phone so no need to stand in the ticket line. Thanks AMC! Super easy to use. I love super easy. Love the app! I’m an A-List member, but that isn’t why I love it. Buy your seat online, concessions at some, and avoid lines! I love the app, I’ve also enjoyed the 3 movie a week plan! I wish we had a few more movies open, but that’s not the apps fault! 4 stars because of the remind me feature, I wish it was easier to add movies to a list you wanted to see rather than having to wait for them to be available in the section. I love this app, being able to order tickets and go straight to the entrance. No ticket lines! If you store your credit card, you can select showtimes, seat locations, and pay in under two minutes. I haven’t hit any snags yet. A pleasant app experience. So easy to figure out very nice to look at User friendly Love it! App is so easy to use, never experienced any issues. Makes going to the movies so easy no line, no hassle. This is a super fast to purchase and check your rewards plus many more things , I really love this app. This app is great, it’s super fast to use and finding movies and seats is Super easy. Also with the pre-ordering of popcorn and or drinks and candy which they deliver to your Sweet Smeat Seat at the time you pick to get it delivered is Awesome!!! Great app, never had a problem and extremely easy to use. I simply love the AMC company. I love this app I order all my tickets ahead of time, I order for all of my friends and family too. I love being a stubs rewards member and when I return from vacation I’ll be joining the AList! Had one glitch and was down for a day in eight months! Super app and very user friendly. Great we can reserve seats with no additional charges! If you have an AMC you can go to, A List can’t be beat! I find the app very easy to use and helpful. First, finding out info about the movies is easy, clear and concise. Showtimes are easy to access with a wide range of dates available. Second I like the ability to see what seats are available and select and purchase tickets ahead of time. Makes things quick and simple. I haven’t used the app to purchase snacks as I prefer to do that myself once I arrive. Not thrilled about my stuff sitting in the little cubby for who knows how long and which anyone can access. Overall very happy with the efficiency, simplicity and user friendliness of this app. Great app. Super easy to use. Before I became A-List, I used this app, Atom, and Fandango. Now that I’ve subscribed to A-List, I’m a real fan of this app’s simplicity. I love that whenever I purchase a ticket, I have to use my fingerprint for validation. I love the home display of movie posters, and when you click on the posters, you can see movie overviews, audience ratings, and videos. It’s just really easy to navigate through as a whole. I’d encourage AMC’s developers to prepare for major releases of tickets so they can prevent downtime like when Avengers Endgame tickets went on sale. This is one of the best things I have ever been a part of. AMC has delivered on a promise , and provides some of the best movie theaters in terms of comfort and quality. I love the convenience and to be able to cancel and get your refund. I absolutely love this app and also being an A lister! I’m constantly on here booking reservations, seeing what’s coming out soon, and checking out trailers. Such a useful app! The AMC app is pretty solid. It keeps a decent history of your movies. The first time I experienced problem was when Endgame ticket sales crashed the site, and not only was making that reservation difficult, but trying to pull up your current reservation for a movie you are about to watch also failed. I can understand those situations. But when there are no huge crowds crashing the website and the app still have an error importing a movie reservation, tells you to try again, then said to come back after 15 minutes (because I did not complete the last reservation request), that really irritates me. I am trying to get a seat reserved for a movie showtime that no one has even reserved any seats for, and be told some lame excuse that the seat I selected was no longer available. I hate lies, especially lies programmed into the app by developers that don’t give a F! I love AMC theaters! They are well maintained, clean, and the seats are comfortable. The app is also fantastic and well designed. App is great. Even more reason to pay $23.95 for up to 3 movies a week subscription. What really makes this subscription awesome is not the money you save. It’s watching all the movies you likely would’ve never seen in the theater. App has a good UI and works great. I like how I can put my movie ticket into my Apple wallet. No reason to rely on internet connection to access your ticket. So easy and convenient to use, never have any problems, love this app!!!! I love this app, I never have any issues and it’s very easy to use. Thank you AMC! App works great and makes it super easy to see three films a week. Only wish is that they’d develop a family plan where you could add more people to one membership. But as is, it still works well. I have been going to AMC since I moved to Hampton in 2011. I remember becoming a stubs member and it has evolved tremendously since then. The app is so convenient and easy from having to stop by the ticket booth to going to a kiosk and now just walk in the door to scan and go. No more waiting in line. The stubs process is easy to track and use. Even getting tickets and selecting seats makes it so much easier for me vs the old me that used to play musical chairs looking for the right spot in a somewhat full theater. Love that I get reminders for movies I want to see in the future that I would otherwise forget about or remember after all the hype about is spelled out on the internet or from a friend. Overall I love the app and it has evolved like everything else in our world. I love this app! I should first say: every movie lover should become an A-list member. It is so worth it, plus it gives you so many benefits. I just ordered tickets to see Avengers: Endgame for my boyfriend and me, and I paid $0. I was amazed! Secondly, the app makes purchasing a ticket so easy. You make an account and add a payment one time, and you’re set every time you go to order a ticket. I love it! Absolutely love love this App!!! I’m loving my AMC app. I haven’t had any problems at all. I recommend this to everyone. Mostly Awesome, still could be better. Overall, this app works very well. As an A-List user, it’s SO much easier than MoviePass ever was. Adding a second person, picking seats and navigating the site works really well. The part that gets glitchy is the upcoming shows. Trying to see the relatively “big movies” coming out over the summer is impossibly drowned out by a seemingly never-ending list of movies that I never seem to see them listed in a theater. Most don’t have any info or poster image. The order is also non-sensical. It would be great to be able to sort by release date/ month. Or filter out movies that are limited release with no info/ image. Love the A-list membership and love the app!! I can pick the movie, showing, and seat at home, then walk right in and sit right down!! It has changed my movie going experience entirely!! AMC App is by far the most convenient; free reservation cancellations up to the start of the movie, seat selections, pre-ordering food and having it delivered to your seat...there’s simply not enough I can boast about the service provided. I’ve had no issues, and being able to see 3x movies per week, 4x weeks out of the month = 12x movies for $20 bucks per month. Best service I’ve ever encountered. AMC theater apps and Alist is simple and easy to use. Anyone who is a movie fan needs to have Alist ($20 a month, 3 movies a week). The best app ever! So convenient and informative! I love using it. They do a nice job with this app. Works well, convenient. Saves time and I dig the wallet integration too. When I buy tickets I get the QR code sent to me or stored in my digital wallet and I just show that to the ticketed when walking in and I’m done. Love it! It’s been awhile since I used the app since in different city with fewer AMC options. The app interface is slick and works well. Not sure if you can save tickets to Apple wallet but that would be nice feature. The app works great with A List. Reserve seats is great option. Love this app and the newly renovated AMC in High Point, NC. However, you can’t utilize the college discount for ticket purchases on the app. There should be a way of doing this on the app so you could purchase tickets ahead of time for big title films. I am now an A-lister since we go to the movies at least once weekly. The app is easy to use and fast. If we change our minds, the refund portion is also hassle-free. Keep in mind that some theaters may not have all theaters with recliner seating, so be sure to check out that option. So glad I have the app! This app is so useful and easy for use. I check open seating, make reservations, plan ahead, check my points, etc. The My AMC section is great especially instead of having to carry an extra card. The only thing that I wish could be avoided is checking my ID when entering the theater; juggling my popcorn bucket, purse, phone with app, and pulling out my license is some hassle. Other than that, I haven’t had any problems with this app. Very easy to get tickets. Love the Stubbs program. Smart move by AMC for people who like to see movies twice. My wife and I purchased MP this summer and loved it; however, after they were bailed out and restructured due to growing so quickly— we fell out of love with them and wanted something different. In steps AMC and their program (twice the price of MP) but worth at least that much in value, if not more. We get to see any type of movie in any format (IMAX, 3D, Digital) 16 times monthly and skip all the lines. If we just went to the movies that could easily be a value of $384 for our family that we get in exchange for $40 monthly ($20 each). Seeing 4 movies each week isn’t always possible be we see at least 4 and our value for money spent on the pass is eclipsed by the time the 2nd movie of the month ends. The only improvement I would hope for are simply selfish to ask for but hopeful nonetheless; something like for every 50 movies you see you get $10 dollars to spend at the concession stand. We are very happy customers and would suggest anyone on a budget with a love for the cinemas to consider this pass. This app makes it so much easier to find interesting movies, see what’s playing in different AMC theaters and compare in seconds. I’m definitely a planner and with this I can pick a movie and a seat about two weeks in advance. It’s also great if you find yourself having an afternoon open to see a movie. The perks are nice, having a-list really is worth it 20$ a month for basically 12 movies a month is a no-brainer. There are also perks at the concession stand. My little brother literally ralphed popcorn seeing as we upgraded to large for free. Seriously if you love movies do yourself a favor get this app, get a-list and get watching. Love the fact that I don’t have to rush to get to the theater to get a good seat. I love it! We don’t go often. It seems pricey but then again it’s a night out for 4 of us. The app is helpful and easy to navigate- I like the stubs club for giving us some breaks here and there. Great app. Easy to use, never glitchy, and I love the AMC A List! We have a local theater, but we would rather travel to AMC which is a 35 minute drive for us! The staff is amazing and the place is so clean and comfortable! After spending 10 minutes setting up a new account it told me I could not set up account because my email was not already in the system. How stupid is that? Happy AMC understands what movie goers want! I love being able to pick movies and seats at home before I arrive at the theaters. Today I used Express for my first time to order popcorn and a drink. I hope we get the option where they deliver to your seat in our area. I’ve used this app successfully before but I have $26 loaded on my account and it won’t let me order tickets? It gives an error and no way to fix it. I call the theater and no one answers so....I guess we just won’t see the movie? It is very convenient—we love ordering our seats online and it is so easy to check in at the theater. One concern would be that the seat numbers are not included with the ticket—sometimes we forget! Couldn’t live without it now! Live this app! Makes going to the movies so much easier! Knowing our seats are reserved we never have to show up early anymore. And love love the reclining seats! Thanks AMC! AMC app makes getting movie tickets much easier than actual going into the theater . Great App ! Love this app! So easy to use and you can get all the movie info at your fingertips. Awesome! Super easy to use, and lots of options available! I’ll never order tickets another way again! I have tried to Order ahead our food several Times and it Is not working. No one at amc will help. Fix the app!!! The web isn’t working either. My kids hate standing in lines, and I just get stressed out trying to keep them still. Ordering on the app before we get there avoids all the stress. I really like the AMC app. It is really easy to buy tickets and see available movies. Realmente me gusta la App de AMC. Es bastante fácil comprar boletos y ver que está en cartelera. This app makes it so easy buy movie tickets. And there is no worry of seats since they can be chosen in the app. My only problem is the service fee witch can add a lot of many depending on the amount of tickets. But purchasing amc premium stubs gets rid of the service fee, it’s worth it to get it. I saw the reports and read the articles on both products. It’s clear Movie Pass had it wrong and that AMC has stepped up and provided a MUCH better alternative. I love movies and I love the fact that AMC provides and opportunity to see any movie anytime I see fit. Movie Pass allows three movies per month. I want to see more than three movies per month than three and AMC GETS IT!!! The app is user friendly and is easy to navigate. It is easy to make reservations and cancel if necessary. For $20 a month, this is a steal and I enjoy passing my spare time in a movies theater that provided quality movies, great facilities and a more than fair price for entertainment!! AMC thanks and keep doing what you are doing!!! Love this app. I can view what's showing and going to be showing. It is easy to purchase tickets. The benefits aren't all that bad either! This app is so convenient! I don't have to wait in any lines, I can select seats, purchase my food ahead and have it waiting. I highly recommend that you use this App if you're an AMC movie fan! The AMC App is better than it needed to be which is much appreciated. There are some bad movie theater apps out there but this one is easy to use. Great app makes going to the movies way to easy and the app itself is really simple to use. Love being able to purchase tickets from my phone and track my rewards at the same time!! Great application and great movie club, great theaters! Easy application and easy to refund! I love how convenient this app is! If I need to cancel my reservation, I can easily do so. My A-List card is easily accessible. I can easily find show times, nearby theaters, new and feature movie releases, etc. Overall, great great app. Highly recommend it. This app is very easy to use and find your favorite theater and movies also convenient ticket purchase quick and easy! I love this APP! Great app for movie lover! Best place to see a movie! Friendly staff, great service and the food is wonderful! This app makes reservations so much easier than the website! No need to wonder if seats are available or if your group can all sit together. Just check the app and buy them online! Way Easy!! Love it! So convenient and easy to purchase tickets. If you were smart you would get the app tons of saving, way better than using internet! Great service at a great value if you love the cinema experience. It has never been so easy to go to the movies. I love going to AMC theatres and half of the reason is the convenience of this App alone. I can purchase my tickets at the push of a button and access my points easily so that I can be ready to get right into my seat. It’s says I need to update my debit card?! I updated my debit card because it told me to. Doesn’t seem to actually update, says I can buy tickets at regular price and I can’t get my reservations! what is going on?!!!! Anybody else have this problem? Love how easy it is and how easy-it is to find everything just a great app. A-List is the way to go!! After MoviePass became a flop I tried Cinemark’s monthly movie deal and it just wasn’t enough passes per month. After using AMC A-List I believe I have found the holy grail of movie subscribers and the app is just a cherry on top. I can reserve seats, buy for my friends and even plan months ahead on some movies. Not to mention the links to IMDb for trailers, that always helps when deciding on a specific movie for a group. Love the AMC app especially now that you can purchase $5 ticket Tuesday! I have used other two major movie subscriptions, but they’re no where near to AMC Stubs A list. There are so many things which makes “A list” to stand out of all movie subscriptions. But the one I likes most is process of booking and canceling tickets. What a piece of garbage. Super hard to set up with nothing but problems. Then it doesn’t even work correctly and all I get is error messages when I try to use it. Useless. Use fandango instead. Would like to use my tickets from work on app. I’ve been going to the Colonial 18 theatre since it’s been open, and I’m a frequent flyer there. When they upgraded to assigned seating 💺 that became an even bigger plus. Being able to guarantee my seat is great. My ONLY WISH is that they would set up the app. to be able to use the discounted tickets I’m able to get from work. I’ve been told it’s ‘in the works’ but that has been some time ago. Easy to use and no issues! Easy to use and fast! Love our App and Alist! Combined with Movie-going and saving money through having an A-team member ship—this connection is the Bomb!! The only glitch I have found is in the Gift Card payment interface. Otherwise the App works really well for a consumer. Keeping the tradition alive. Thank you! Wow they all this fancy dynamic crosssell to wget mento upgrade. Too bad the core ability to buy tickets works less than half the time. Fix that then tell me about all the great programs you have. We love the AMC App! My husband and I subscribed to the A list plan a couple of months ago. Date night just got so much easier and the app couldn’t be more simple to navigate. We have accumulated reward points and have been able to redeem them for popcorn and sodas. We love AMC theaters as most of ours in Charlotte are updated, very clean and conveniently located. Thanks for all the entertainment AMC! Super easy I like there features... now if only I can get my friends to catch on. My favorite go to app for my movie purchases, it’s quick and easy with zero hassles. This app is so unreliable! Works like a champ! Love the discounts! Technology is great when it works :-) Finally an app that performs as expected! I recently signed up for the AMC membership because I see a lot of movies. After I signed up, I was able to order a movie ticket for the day. After that, I could not log into the website or the app to order anymore movie tickets. I called and they could not help me so I had to cancel my membership because I’m not going to pay for a service that I can’t use. There was a $34 cancellation fee. So I just payed $20 to sign up less than a week ago. I saw one movie and had to pay over $54. This is absolutely ridiculous. Will never go to AMC again. Smooth as silk when it comes to getting you tix! It’s been great so far. Loving seeing whatever movie I want. They finally fixed all the bugs and the app is now super convenient! Using the app is very convenient and easy. I am no way techie, this app is awesome! Easy to use and very user friendly! It helps me save time. The few times I’ve had a problem, a customer service rep has addressed it quickly. Bravo AMC! I see very little reason why you can’t make tickets available until the Wednesday before the showing. It’s Tuesday and I can’t buy tickets for Friday just 4 days later. When all the other theaters have them available you should be able to do the same. Maybe your app is great in all other aspects but if I want to plan even just several days in advance then this is not the theatre chain to use. Everything looks and works well except for the credit card scanning feature while checking out. I wish I could just use apple pay. I love having this app and being able to pre-order my tickets and snacks. No standing in line waiting, I can just walk right in, pick up my food and go sit down. I’m an A-Lister and use this app 3 times a week. It works great! This app is convenient and most importantly very fast. I love it and have been using it a lot. App is very easy to use. User friendly. Great app. Awesome app! Love the rewards program and the fluidity of the app. Keep up the good work AMC! So many apps are troublesome- this one is a breath of fresh air. It works. It really works! Reviewing information is easy. Booking is easy. I am a fan!!! Best idea every. They make it SO convenient to see a movie! You can book online to see any movie any day you want. Then the ticket goes on your phone. Free upgrade on popcorn & sodas. Special line for snack😱. Really no reason not to do it! Three movies EVERY WEEK! The only issue I’ve had with the app is, as an A-List member we get 3 movies a week, but we can not get advance tickets without it counting toward our three per week limit. So if I want to reserve my ticket to an upcoming show, it counts toward your current week and not the week you are reserving the ticket for. This is very inconvenient. I do like the app and all the features although not all app features are available at every theater, like ordering your food and drinks online. I love this app! It’s easy to use. You have multiple electronic options to get your ticket, save to wallet, text, use the app. I love how easy it is to use. Great app and easy to use!!! It's easy to use and saves us time! I hate waiting in lines. Highly recommend getting the a list subscription since it’s only $20 a month, which is about seeing one and a half movies. So I basically see two movies and I save money. I also get upgrades for food and drinks plus $5 reward cards every couple movies. Lastly the best part is I can order for movies way ahead of time before the actual date and actually choose my seat weeks or even months before the movie comes out. Keep up the good work! This doesn’t make sense. Why this App charge Convenience fee when used to purchase tickets. It is very inconvenient for movie goers for paying extra. Can purchase online and see showtimes! Never miss another movie showing with this new app! 💕 it! Love that I can purchase tickets through the app and just show up with my phone. The app works really well for booking tickets ahead of time, and I like that I can add tickets to my Apple wallet. The only problem I have is that when I try to watch trailers within the app, they don’t play with audio. My wife and I hit a movie a week and always buy them online. We’ve lived all over the US, so I feel we’re qualified to rate the AMC App vs. all of the major national chains. The AMC app I’d hands-down the winner! It’s a breeze to select theaters, movies and movie times. I particularly like the way a synopsis of each movie and summary of its caste, along with summaries of reviews by movie-goers and critics. My favorite feature is the ability to order concessions ahead of time and pick our order up right as we enter the complex without waiting in long lines, or fumbling for change! App needs to be overhauled. Slow and unresponsive. Sad! Pretty much everywhere I go I always choose AMC. They’re also my local theater. The A List program is great!! I also am amused that there is a section for customers to put the best bathroom break times ha. I love it! Get to see 3 movies a week. This app makes finding a movie and buying ticket so easy. Plus, the app has previews for movies and reviews. A perfect app for the movie goer. Convenient and easy to use. Love it! Great way to order tickets!!!! If you are a Movie head like us, this app is for you. I like that I can reserve my ticket but when we go to the theater we have to pull up our email. Should that information pulls up on the ap so we can just use the ap to get in. Another thing is I can see the movies coming but the function to see when the movie is coming to our local theater doesn’t work, so for us it’s guess and wait. I hope some of these things get fixed, I will change my rating. So thankful for this app. It makes it very easy for me to set up me and my wife’s date so that when we arrive to the movies, all we do is skip the line, scan are tickets, & go in! Easy to navigate A list card is with you at all times Soda and popcorn upgrades 3 movies a week with no limits between standard, Dolby or imax. I don’t write reviews so mine will be short and sweet. There isn’t many times where an app and service works perfectly In sync. The app is easy and the A LIST is amazing. Service is great. Thank you AMC. It’s always a great place to go, reserved seating and rarely if never at all, have I encountered any issues. I always go to ANY theater and it is always a great experience. Highly recommend AMC. Love AMC the seats are superior, that app makes it easy to buy tickets to movies and track my AMC Stubs rewards and I love being able to buy a specific seat so I don’t have to show up an hour early for popular movies. AMC is truly at another level for customer comfort and service. Joined the stubs program, love the AMC theaters, app is super convenient! How would u like to reserve your seating for the new block buster hits, skip the lines and just walk in - keep track of all the rewards you have earned and even enjoy a express line for popcorn and other movie refreshments- that’s all possible with the AMC app - it’s one of those wonderful experiences where u feel pampered and privileged- the funny thing about it is you are making all of this happen yourself within the app. It’s 2019 so save yourself the hassle and go high tech. I promise you will think to yourself why would I ever what to go back . Nice Job AMC. Been experiencing a lot of auto logout, opened the app and it says that I need to log in or my network was stable while my other apps worked with no problem. Has to be the best rewards program for movies there is! Less than the price of two movies gets three movies a week. Unless you can just throw money away there’s no reason for you not to have it! This app made purchasing a breeze! Was very user friendly. I love AMC THEATERS it’s my peace of mind with great comfort. Keep up the greatness and thanks for your business. I use it all the time, worth signing up for the Stubs membership! When application is on wifi constantly has loading errors. The moment phone switches to cellular data application loads up perfectly. Wifi connection is confined stable. The app makes it easy to buy tickets and reserve seats. Tickets go to Apple wallet so we can just drive to theatre and go in! No lines. No hassle. Best way to book your seat! This app is the best way to get your tickets! Super Super convenient! Love this app makes going to the movies so easy!! This is probably one of the best App’s on my phone. I Avoid long ticket lines - pick my movie, time, and seat and purchase my ticket in less than 5 minutes- then when I go to the show - I waltz right up to The ticket taker and he scans my ticket on my phone and I am in like Flint. Love it. Love this app and the theatre. Great job AMC!! For those who love movies... it can’t get better than this! I can reserve the exact seats I want. I can use touch ID to make my purchase. Very convenient. I can also set reminders for future movies, when tickets are available for purchase. I have no complaints, and it has given my husband and I lots of great dates! I am so excited that we switched from a previous Movie APP to AMC’s!!! It is extremely easy to find what I want and buy a ticket in seconds! It keeps track of what I want to see and I can reserve my seat days ahead of time. Thanks AMC! App is pretty convenient and simple to use. Minus one star for throwing upgrades at you constantly. Would like to see Apple Watch wallet support so I can just use my watch to lay or show my ticket bar code. My husband and I are A listers. We love choosing seats, purchasing tickets and using the app for our entrance to the theater. My only wish is that you could choose a day and THEN look at various movie times, options, etc. Currently, you have to change the date on each individual movie if your checking a day or two ahead. This app is easy and convenient for trips the the movies. Having the ability to choose your seat and secure your tickets makes an afternoon out or date night a breeze. We use the app along with the Stubs A list service and it works great! Well worth the cost . You basically get your money back the first movie you see . Tons of great perks as well . Rewards pile up quickly . Easy to use app. Can even pay with fingerprint. Love seat selection. Easy go back and forth between showtimes to see what’s available without having to reselect how many tickets, like others make you. Great easy to use app? I would just like to be able to add tickets to an existing order. Quick and easy to use app. Works as expected. It’s very easy and convenient to have!!! A great app! Had it for a while but recently upgraded to A-List and its so easy to use this app to purchase tickets! Wish the theaters were cleaner but I’ve seen every movie! After having MoviePass for so long, felt like I was coming out of a toxic relationship and I could never love again. My heart was hurt. But this app made me believe that I could have a healthy and amazing relationship with a monthly subscription movie pass. Easy to use and conscientious to use with A -List. Would recommend to friend and family. Great app. I use it all of the time. This is a great app!! It saves all of your movie tickets. You can order food ahead of time. Just a couple of clicks and you are finished. Very very very convenient!!! Great app! I use it to reserve tickets. One less star bc it’s not easy to see when future releases will be available at my local theater. I have to wait until it’s playing to know where to find it. Super easy to use! You get points to redeem with your purchases. You can reserve from home! The A list program is awesome! This is the app I rely, it is the google maps of entertainment. No where or when I can get a movie in. Super fast, very effective, and incredibly user friendly! One thing I love about the A plus member program is that if you miss a showing on accident, for instance like I did by buying a showing for the wrong day, when you don’t show up they simply refund it back onto your account. It just makes sense. I love this app! It is so easy to use. It makes it nice to have my ticket already purchased before I get to the theater so all I have to do is pick up my ticket, grab some popcorn and go enjoy the movie! Thanks AMC! The new app works great!!! The latest version of the app works wonderfully. I've purchased tickets and scanned my Stubs card via app. I just love that I don't have to carry the card around anymore. 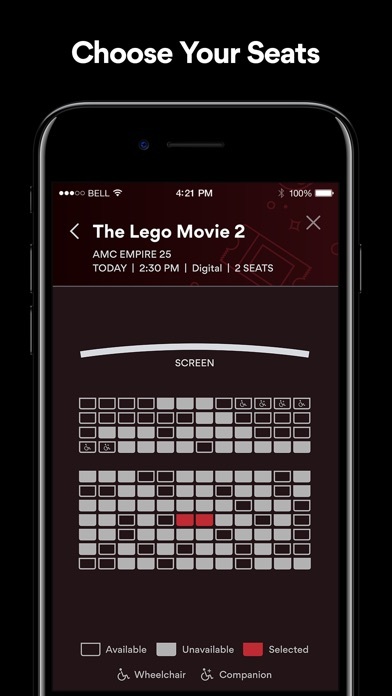 Great app, easy to find quickly what is available, movie times, reserving seats, and purchasing tickets! Great app and very convenient. Wish an A-List’er and spouse could combine accounts for smoother seat selection. This app is amazing & the amc membership is even better! All theaters should be AMC. The A-List subscription is the best thing to date! Love AMC! Love the app and the theater! Easy to navigate, reserve and purchase tickets. As a snubs and A-List member it is my go-to app for Movie info, points balance, credits and specials. Good but NO MOIVE TRAILERS!! Nice but could be better. You will be charged $3.50 “convenience fee” to buy a ticket with this app What other app do you pay $3 every time you use it?! Also, if you need to change the date/time you won’t be refunded AND you’ll be charged again. This is a blatant ripoff. I have AMC A List and I love using the app. It’s so easy to reserve your seats ahead of time without an extra fee. We used to only go to the movies maybe twice a year and now we go once a week. Totally worth it! Only theater we go to! Love the convenience of picking our favorite seat. Never have to worry if we are running late. Great app!! I enjoy the convenience of being able to plan ahead. Picking my seat. And also the savings as a member. A-Number One! A-List! A-MC! Been very happy with this App. Easy to use and love the “Go-Time” feature. App is easy to use, convenient and I love earning points for free food and discount! This app manages my A+ AMC Stubs membership so well and is very user-friendly. More than pleased, thank you AMC! This is great for one person going to see an AMC movie, and works well with A-List. The problem is how to buy tickets for movies with other people who are on A-List or the $5 Stubs tier. There’s no way to do it. Could you at least show which seat number I’m buying so I can tell a friend to buy the one next to me in their app? Also, the reminders feature is a good idea, but implemented poorly. It didn’t work at all for the first few months it was promoted (and tech support didn’t even know how it was supposed to work) and you can’t use it on movies that are out, only coming soon. I’m betting other Stubs and especially A-List members would like to create a list of what’s NOW PLAYING as well as upcoming, to make it easier to plan future outings. This is the killer feature the app needs. I have to close the app to see the time. I have only been using app for about one year but it super easy and convenient. Rewards points helps. Love it! Very easy to use. Love it! I signed up for AMC Stubs A-List after continuous hassle with MoviePass. I can honestly say that the overall experience is a night and day difference. I have already seen 2 movies with A-List this week and plan to see many more movies this month. Reserving a seat though the app is seamless and intuitive. Once I arrived to the theater, the premises was clean and claiming the ticket at the box office was quick and easy. I went to the Dolby theater to see Spider-Man and all I can say is WOW. The sound was amazing and the colors popped from the screen. In the end, all I can say is that this service is miles ahead of MoviePass and I look forward to using this service in the foreseeable future. I’ve already convinced my parents to switch from MoviePass to A-List and I can’t wait to see what they will think of the service. Thanks, AMC! The app serves it's purpose and it is easy to purchase tickets. It is a little glitchy at times but out of all the other major movie theater apps out there this one is by far the most user-friendly. Wish is was easier to save movies you want to see in the future. This app is great! It makes it easy to go to the movies! Cost is minimal and sometimes I renew with the money I earned back! Easy to pick movies and seats. We go every weekend! A really nice app for AMC theaters. The app offers a lot of options and has a very intuitive lay out. Plus the premium Stubs A-List membership is phenomenal! Only thing I would change is maybe adding pictures next to the movie titles when inside theater selection. This app does just what I want it to. I can easily see my movie options, my favorite theater, other theaters, pick my seats, and purchase! No more purchase lines and looking for seats! I love it! If I had any suggestion, it would be to let me use Apple Pay in the app. I Wish ALL Apps were like this! Most apps provide a lot of useless features that never get used. This is definitely NOT one of those apps! This one gives me exactly what I need, and has a little extras that have made movie-going so much easier. (I actually get a kick out of using it!) Thanks AMC! His app is what apps should be. I can make reservations way ahead. Cancel last minute if I have to. Don’t change a thing. Perhaps letting the user choose the start screen. I use the showtimes for the theater much more than going into individual movies. AMC app has worked seamlessly for my wife and I who use it all the time. So easy and simple to reserve or unreserve a seat as needed. I haven’t found that the app leaves anything out and everything works well on m phone. Makes our movie going experience all the more fun.